SANTA MONICA, CA -- Santa Monica police on Monday identified the suspect in an alleged attempted drugging of his date at a restaurant that was stopped by three women dining nearby. 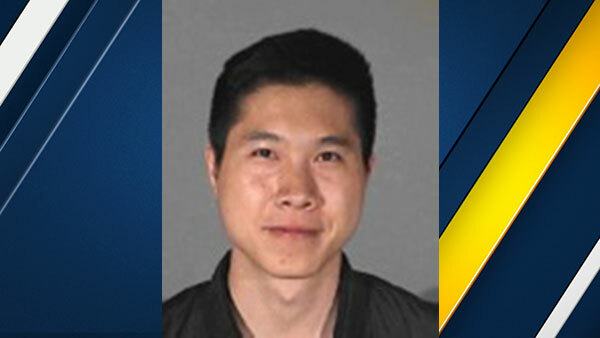 Michael Hsu was arrested after the incident for drugging with intent to commit a felony, the Santa Monica Police Department said. He remains in custody on $1 million bail at the SMPD Jail. The three Los Angeles-area women who say they spotted Hsu dropping an unknown substance into his date's drink told their story on Facebook and created a meme that has been shared more than 110,000 times. The meme shows the three in "Charlie's Angels" poses, declaring "Don't roofie someone on our watch!" Sonia Ulrich, Marla Saltzer and Monica Kenyon said they were out for happy hour at the Fig restaurant in Santa Monica on Thursday when Kenyon noticed a man at another table acting strangely. After his date had excused herself, he appeared to be fumbling with her drink, then dropped something in the glass. Ulrich went to the restroom to warn the woman on the date. The woman told Ulrich that the man that she was at the restaurant with was "one of my best friends" and said she had worked with him for a year and a half. The three friends also warned restaurant management, who reviewed the security tape and then called police. Hsu was arrested that night. Police said they recovered multiple vials of an unknown substance in his possession. Officers also executed a search warrant at Hsu's home, but did not disclose what they found. Police are asking any possible additional witnesses or victims to contact them. Anyone with more information can contact Det. Nicole Serra at (310)458-8941, Sgt. Sal Lucio at (310)458-8760 or the SMPD at (310)458-8495.